Vin Crespi | Crespi research group focuses on simulating new and existing materials at the atomic scale using sophisticated computer code. "I like to push things," says Crespi, Penn State professor of physics and materials sciences adn engineering. "One nice thing about simulation is you can do predictions not only of the properties of known materials and known structures, but you can predict the properties of new ones. In that sense, I try to stay one or two steps ahead of the experiments." Theoretical physicist like Crespi are using computational tools such as first-principles density functional theory to get at the basics of materials properties. Their models conjure matter at the quantum mechanical level, simulating where atoms are moving, what electrons are doing, what the electron wave functions look like, all built on known laws of physics rather than working backwards from experimental results. Inspired by experiments being carried on at Penn State, Crespi began to think about a new kind of silicon in which every atom has three neighbors as opposed to the four used in semiconductor material. He calls it a gedankenexperiment, a thought experiment, or as Crespi says, "If you could make it, what would it look like?" 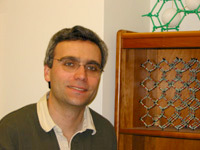 From his simulations, using a computer tool called VASP that uses density functional theory to do quantum mechanical level simulations, Crespi created a lattice with a highly porous multiply connect structure. "We're looking at it because we think it is a new class of structure," he says.